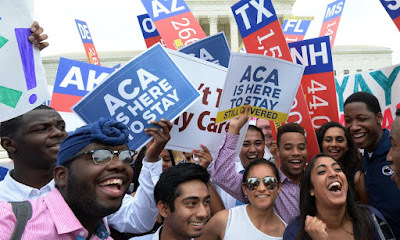 In a widely anticipated decision, the US Supreme Court on Thursday June 25 upheld President Obama’s signature healthcare law, the Patient Protection and Affordable Care Act, against the latest challenge. In a 6-3 ruling the Court held that the subsidies which make healthcare costs affordable for millions of low-income Americans were available to everyone throughout the US, not just to those in states which established their own healthcare exchanges. Opponents had argued that the wording of the law suggested Congress had only intended for subsidies to be available where states themselves set up exchanges for their citizens to purchase healthcare insurance. Because only fourteen states established such exchanges, however, the impact of a decision favouring their position had been widely expected to mean the loss of insurance for between six and eight million low income Americans and the possible unsustainability of Obamacare in the longer term. The latter consequence, the failure of programme entirely, had been advocated by a number of conservative and libertarian opponents of the law. Republican opponents in Congress have repeatedly tried to repeal the healthcare law, thus far without success. The Court’s decision on Thursday cut off another angle of attack. The successful working of the Affordable Care Act rests on three interlinked provisions. Insurers cannot refuse coverage to individuals with pre-existing health conditions. To ensure that people do not wait until they are ill to purchase insurance, the Act requires individuals to purchase insurance in some form. Finally, to make insurance affordable, the Act provides subsidies to families with low incomes (defined as between one hundred and four hundred percent of the federal poverty line) which in practice can reduce the cost of insurance to the individual by up to 80%. Three years ago the Court narrowly upheld a challenge to the so-called “individual mandate” which requires Americans to purchase insurance. This was important in keeping premiums low: including people with no current health problems ensured the risk to insurers was kept low and thus premiums remained affordable. The majority opinion was written by Chief Justice John Roberts. Three years ago he sided with the Court’s liberals to provide the deciding vote to uphold the individual mandate. As a result he was praised by many liberals for his “statesmanship” and lambasted by conservatives for betraying their cause. Since the Court announced in November last year that it would take the case much of the commentary has focused on whether Roberts would take the same path this time. Clearly he did, but he and the Court’s liberals (Justices Breyer, Kagan, and Sotomayor) were joined by Justice Anthony Kennedy who, in 2012, voted to strike down the individual mandate. In the last few months commentators had speculated that Kennedy might be convinced to join the majority but it was just that, speculation. Many will be surprised, and either pleased or dismayed depending on their view of Obamacare, by his siding with the majority this time round. Roberts, however, might be particularly relieved that a second challenge to Obamacare was not decided by a narrow majority which rested entirely on his vote. King v. Burwell ultimately leaves Obamacare untouched, but the Court’s ruling carries huge significance. Twice now the Court has upheld the law against legal challenges driven by its political opponents. While this decision is unlikely to stop the challenges entirely, it does place the law in a much stronger position. The longer the law continues to operate, the more likely people are to simply accept its presence. And as more people benefit from the law, the less likely opponents are to find traction among voters for seeking its repeal. As such, unintentionally, the Court may have terminally weakened the political case against Obamacare. The longer legacy of the decision, however, is that millions of Americans will continue to have affordable healthcare. Emma Long is a Lecturer in American History at UEA. Her research interests include the history of the US Constitution and the Supreme Court, as well as the interaction of religion and politics in American history. There will be massive opportunities for UEA students graduating next year (2016), with the graduate recruitment market getting stronger and stronger. 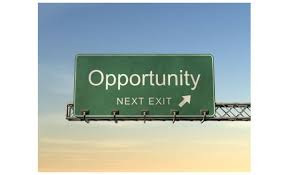 However, many companies will be starting to recruit their 2016 intake as soon as the 2015 Autumn term starts – and if you are interested in the Civil Service – UK and European, then you also need to be ready to act! Don’t miss out on the job you want by not being ready. Instead, gain a real advantage by using your time now and over the summer to think and plan, and then hit the ground running in September. To help you navigate and prepare for the graduate recruitment market, the Careers Service is putting on a special session for students preparing to graduate in either 2016, or 2017. PLUS – hear from, and speak to, recent UEA graduates about their experiences with a free drinks reception! Places are limited, so if you are interested in attending please book now. We know it is probably the last thing you want to do after exams – however, we also know it can make a real difference. Why not end this academic year, by setting yourself up to succeed next year?